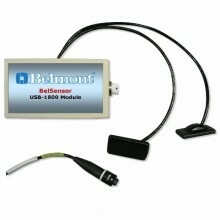 BelSensor utilizes state of the art CCD sensor technology to capture high-resolution diagnostic quality images. Each sensor is encapsulated within a small, thin enclosure that has rounded edges for improved patient comfort. BelSensors are available separately, in sizes to accommodate adult patients (size 2) and child patients (size 1); or they can be ordered in kits that include Belmont XV Lite software, USB interface and cables. - Relative Film Sizes: Size 1 and Size 2 smooth rounded body sensors with 9 ft cable. Click the button below to add the Belmont BelSensor Digital X-ray Sensor to your wish list.